NYP as a whole serves approximately one quarter of all patients in the New York metropolitan area. As one of the largest and most comprehensive health care institutions in the world, NewYork-Presbyterian Hospital is committed to excellence in patient care, research, education, and community service. NYP provides children's health services at two of its centers: Morgan Stanley Children's Hospital (located at 168th Street and Broadway) and Komansky Children's Hospital (located at 68th Street and the East River). These children's services are consistently honored in US News and World Report and rank in more pediatric specialties than any other hospital in the New York metro area. Morgan Stanley Children's Hospital is dedicated to providing the finest in pediatric care. With 100 medical/surgical beds and 91 ICU beds (41 pediatric and 50 neonatal), it is one of the largest children's hospital in the country. Komansky Children's Hospital has 30 medical/surgical beds and 70 ICU beds (20 pediatric and 50 neonatal). The Center provides comprehensive inpatient, outpatient, and emergency services on the Upper East side of Manhattan. NYP Psychiatry combines the expertise and the resources of two leading Departments of Psychiatry at Weill Cornell Medicine and Columbia College of Physicians and Surgeons. NYP Psychiatry is consistently ranked as one of the top programs in the nation by US News and World Report, and in 2015 – 2016 was ranked as number one. Weill Cornell Psychiatry offers a wide range of programs and services at the Payne Whitney Clinic in Manhattan and the Westchester Division. The Payne Whitney Clinic was founded in 1932 in a freestanding building overlooking the East River. Now, the Payne Whitney Clinic is home to comprehensive inpatient, outpatient, and consultation services in the NewYork-Presbyterian/Weill Cornell Medical Center. NewYork-Presbyterian Westchester Division is located on the beautifully landscaped 214-acre campus in White Plains, New York, and has offered psychiatric services since 1894. 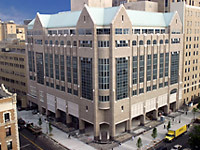 Weill Cornell Psychiatry also provides subspecialty services in pediatric psychiatry at both campuses, including child & adolescent inpatient services, an adolescent eating disorders program, an adolescent partial hospitalization program, comprehensive outpatient evaluation and therapeutic services, and consultation-liaison services to the emergency department and the inpatient pediatric units at Komansky Children's Hospital. The Department of Psychiatry at NewYork-Presbyterian/Columbia University Medical Center consists of a comprehensive program of inpatient and outpatient services. In addition to two psychiatric inpatient units, the Department of Psychiatry at Columbia provides outstanding consultation-liaison services for patients hospitalized on medical and surgical floors. Community-based outpatient subspecialty clinics offer a full range of diagnosis-specific treatment modalities. The Pediatric Psychiatry Service at NYP Morgan Stanley Children's Hospital provides mental health evaluation and treatment to approximately 2,400 children and adolescents and their families residing in upper Manhattan. The New York State Psychiatric Institute (NYSPI) was established in 1895 and thus became one of the first institutions in the United States to integrate teaching, research, and therapeutic approaches to care of patients with mental illness. Since its inception, the Institute has experienced dramatic growth and has become a nationally recognized resource for groundbreaking research and clinical practice in psychiatry. The Sackler Institute at Weill Cornell Medicine was founded in 1998 as the result of a generous gift from the Mortimer Sackler, M.D., family. Since that time, the Sackler Institute has earned an international reputation for education and research that uses cutting edge developments in brain imaging, human genetics, electrophysiology, and behavioral methodologies to study typical and atypical human brain development. The Sackler Institute at Columbia University was established in 2001, and it brings together an interdisciplinary team of Columbia research scientists to explore the processes of early development and how these processes relate to the etiology and treatment of psychiatric illness. Supported by an endowment from the Sackler Foundation, the Sackler Institute at Columbia is dedicated to an investigation of the complex processes underlying development from the molecular to the psychological level. The New York City Children's Center - Queens Campus (NYCCC — Queens) is a New York State Office of Mental Health facility located in Bellerose, New York. NYCC-Queens provides inpatient services designed to treat seriously emotionally disturbed children in a therapeutic setting where they can develop life skills in a structured environment. NYCC-Queens also operates school-based day treatment programs in Queens and Manhattan which offer intensive clinical and special education services to children and adolescents.